My brother in law Dimitri died yesterday of a cancer. I have only 1 big problem with Dimitri : he died way to soon, at 37 (29 Jan 1975 – 03 Apr 2012). Dimitri was a great guy. Dimi, we will miss you. 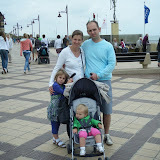 This entry was posted in Perso, Photos on 04/04/2012 by jfdeclercq.